Helping student's move into college effectively is one of the most important responsibilities for an academic advisor. Academic advising should focus on building a relationship between student and advisor. The relationship established in the advising process can contribute to student success and retention. 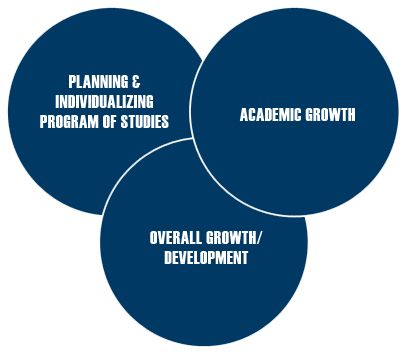 Developmental academic advising uses interactive teaching, counseling, and administrative strategies to assist students with achieving specific learning, developmental, career, and life goals. As an academic advisor you help students develop and focus on their potential for growth, explore with students the factors that lead to success, and show interest in the student's academic progress and extracurricular achievements. Academic advising can be viewed as a three-dimensional process. The diagram below represents an overview of this process. Know academic policies, procedures, and regulations such as drop/add, retakes, academic probation/dismissal, academic fresh start, financial aid, etc. Know degree requirements and remain informed about changes in your curriculum. Map out a plan of action for your academic career and review it with your advisor. Seek specialized assistance from academic support and student services department as needed. While your advisor is available for your help, there are limitations to what services they should provide for you. Ask them for references to specialized services such as personal counseling, career and employment services, tutoring, etc. Know the information contained in the university, college, and departmental sections of the University Catalog.